Morrissey in the mid 1980’s. Perhaps the most remarkable aspect of Morrissey’s Autobiography, which Penguin published in the United Kingdom and the rest of Europe last Thursday, is that it exists at all. It has been rumored roughly forever. As recently as September, the Atlantic put together a convincing case that its imminent publication was a hoax. In fact, the British pop icon’s memoir was merely delayed, reportedly over his insistence on a Penguin Classics designation—a black-border badge of literary immortality assigned, in this exceptional case, before the book’s actual birth, which is rather a royalist attitude for someone who once made a great record called The Queen Is Dead. What links other Penguin Classics authors is death and veneration; Morrissey has always longed for both, first as lead singer of the Smiths—the greatest band to emerge from the extraordinary British postpunk renaissance of the 1980s—and then in his resilient solo career. If the reports are true that he held Penguin to ransom over the Classics imprimatur and won, then Autobiography is an act of hubris at once appalling, hilarious, and diabolically brilliant, much like the writer himself. Whether as the sneering wraith twirling gladioli during the Smiths’ first appearance on Top of the Pops in 1983 or in his beefed-up, rockabilly-mechanic guise of today, Morrissey, now 54, has held fast to the mindset of late-20th-century pop music’s great object and subject: the existentially bewildered adolescent. It’s a state of morbid petulance and persecution, of sensational narcissism and wild emotions keenly felt, of Eros and Thanatos fumbling eternally in the backseat. It’s a state of mind that produces lyrics such as “If a double-decker bus crashes into us/ To die by your side is such a heavenly way to die” and “I wear black on the outside/ Because black is how I feel on the inside.” It’s also the state of mind of Autobiography. Alone and misunderstood, his passions unrequited or confused, the mopey teen in his bedroom carves out a jealously guarded sanctuary of rebellious beauty and sullen wit—and for this one mopey teen, emotional penury becomes a life force, straight through to middle age. Autobiography has no dedication page, which is one of the many very Morrissey things about it. Steven Patrick Morrissey is a legendary control freak, which reinforces the impression that Autobiography had no editor. It has no chapters or index; its chronology is linear except when it isn’t; its first paragraph is 4 ½ pages long. Early on, the apparent lack of a guiding hand isn’t a drawback—it’s sometimes even a virtue. 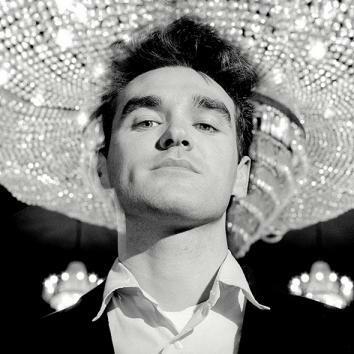 Morrissey writes with fondness and fierce loyalty of his Irish Catholic family, but with terrified revulsion of their hometown, “forgotten Victorian knife-plunging Manchester, where everything lies where it was left over one hundred years ago.” He renders his childhood with a mordant wit reminiscent of his hero Oscar Wilde; his entry into the world is a perfect egomaniac’s epigram (“Naturally my birth almost kills my mother, for my head is too big”), while his only sibling whets his appetite for paranoid melodrama (“My sister Jackie, older by two years, is interrupted four times as she tries to kill me; whether this be rivalry or visionary no one knows”). The miracle of the Marr visitation is the moment that Autobiography begins to curdle, and when the dearth of editorial supervision begins to show. It’s here that Morrissey’s account of the Smiths necessarily begins to compete with other, more reliable narratives, and here that his miserablism turns out to be congenital instead of contextual. A scant two years after the first Morrissey-Marr meeting, the Smiths’ self-titled debut album, released on seminal postpunk label Rough Trade, hits the U.K. charts at No. 2, but because it is not No. 1, Morrissey writes, “My life sinks.” He launches endless ad hominem attacks on Rough Trade founder Geoff Travis and newspaper journalist Julie Burchill (the latter for the unanswerable crime of writing the following sentence: “Morrissey lives with his boyfriend in Santa Monica”). He devotes some 45 ragged, repetitive pages to an astonishingly bitter and self-serving account of Smiths drummer Mike Joyce’s successful 1996 suit for a higher percentage of the band’s recording royalties. He touches a few times on the charges of racism and nativism that have dogged him back to his Smiths days, but only by railing against the stupidity and mendacity of his accusers. And his rendition of the Smiths’ 1987 breakup is incongruously Zen and completely at odds with the established story—not to mention cruelly devoid of gossip. And how does Autobiography rate on gossip? The enigma of Morrissey’s sexuality, such as it is, remains mostly intact: He suffers through what he derides as “cupcake encounters” with girls in his early teens, falls in love for the first time with a man in the mid ’90s, and briefly considers “producing a mewling miniature monster” (!) with a woman (!?!) at the turn of the millennium. But it’s all pretty vague, as are the celebrity anecdotes. Tom Hanks shows up backstage but doesn’t complete a sentence. Visionary British filmmaker Derek Jarman, who directed three Smiths videos, is introduced solely so that Johnny Marr can be glimpsed vomiting in front of him. The closest we come to an action-packed set piece is when our militant vegan narrator coaxes David Bowie away from a buffet spread of cold cuts. Autobiography by Morrissey. Penguin Classics.